Former Bake Off host, passionate animal lover and comedian Sue Perkins, is our indispensable guide to the animal kingdom. Join her on a comical, insightful and, at times, shocking nature trail around the world. In this mad-cap adventure, she introduces us to the amazing, surprising and hysterical truth about all creatures great and small. From the African lungfish to the kangaroo, get ready for an irreverent, funny and often furry journey of discovery. 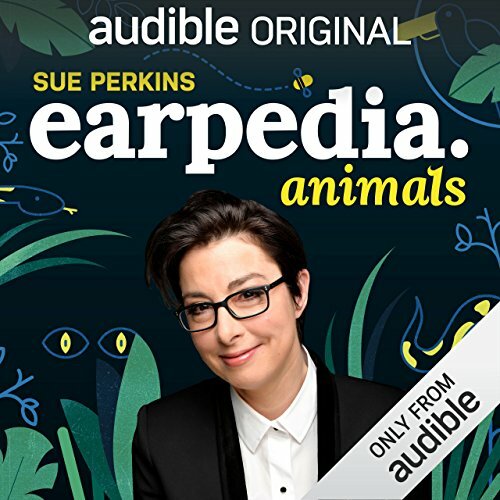 As an Audio Show - free for members - when you add Sue Perkins Earpedia: Animals to your library, you'll get all 13 episodes, each with a runtime of about 10 minutes. What made the experience of listening to Sue Perkins Presents Zoopedia the most enjoyable? Sues quick wit and zany sense of humour make this such an enjoyable listen. Some of the episodes are better than others as should be expected, but overall a stunning performance and full of interesting facts and educational too.. And it's FREE! Love Animals? Love Sue Perkins? Listen! Would you listen to Sue Perkins Presents Zoopedia again? Why? I am a Sue Perkins fan and her quirky, funny little animal stories are like a sort of Horrible Histories for animals. Funny facts and little sketch comedy style jokes. Also very informative. I just wish there were more! What was one of the most memorable moments of Sue Perkins Presents Zoopedia? What does the narrator bring to the story that you wouldn’t experience if you had only read the book? That was an amazing listen, I could not seem to stop. So much to learn and so little time. Some of the behaviours made my stomach turn but others were so fascinating. A great run of short bites so good for a trip to school or round to the shops to keep you entertained. Sue is great, but some of the little sketches between her talking... Eh. Some are a little funny, but they get kinda tedious. On the whole, interesting info, told in a simple way with a few little jokes. Good for kids and adults alike. Rather adolescent in tone and why does Sue seem to hate every single animal she meets? Audiobook Blogger. Linktr.ee/MLHearingThings. Follow @MLHearingThings on Twitter, FB, Instagram, & Goodreads. Great fun but all too brief. Sue Perkins delves into natural history to shine a light onto some familiar, and some less familiar, animals from around the world. Very lighthearted and good for when yo want a quick listen. I love Sue's weird way of looking at the animals, however one can learn about them too. Listened thinking it would be funny and factual. But the jokes are extremely rubbish. Might be entertaining for children. Fun! And informative! I love Sue's humor and I had a great time learning information about animals I'd never heard of and new information about animals I knew a little bit about. Half encyclopedia, half stand-up routine, real fun to listen to. There’s a lot of interesting information, but Ms Perkins tries too hard to be funny and I find it very distracting. If you are a fan of "True Facts" you will love these glimpses into the details of various animals. Entertaining and informative with hilarious sound effects and cut-aways. I am eagerly waiting for more! I knew she was funny, but her Earpedia: Animals is hilarious! Smart, interesting, and snout-ticklingly funny, this series is all one could ask for in educational entertainment. A collection of animal facts that both inform annd entertain the listener. I am surprised to find it free on Audible. Here's to Audible and being generous! From start to finish, Sue Perkins is a gem. Funny, smart, and absolutely delightful. Loved this! Fun, hilarious, quick and informative. Sue is wonderful and shares her love for peculiar animals in a witty and gut busting way. Audible App still has no ability to play multiple episodes in a row, something that basic podcast apps have supported for years.